It’s no secret that a professional photographer will make up a considerable amount of your wedding budget. But, money isn’t the only difference between a traditional photographer and a compilation of images from your friends and family. With the internet and technology becoming such a big part of our lives, we have the perfect resources at our fingertips to make a wedding truly memorable – and remembered. Here are a few ways to crowdsource your photos and still get those perfectly candid, frame-worthy shots. Nowadays, almost everyone is on social media. Instagram is a popular one, but many different platforms have adopted hashtags as a way to consolidate and search for specific posts. A unique wedding hashtag gives your guests an easy way to save photos and videos of your wedding, all in one place. Before choosing your wedding hashtag, make sure it doesn’t already exist on any of the platforms you plan to use. Once you have your title in mind, share it to all of your potential guests before the event. Request that they use the tag on any of the images they take during the event, and emphasize that you will be relying on their memories to curate your own. It gives everyone an easy but important role in the ceremony, whether they’re in the wedding party or not. Everyone loves to show their competitive side, especially if they have the ability to win a prize. Turn this into a game by offering a prize to the person who posts the most (or the most unique) photos to the hashtag, app, or website you choose to use. A gift card, event voucher, or even movie tickets would be affordable but interesting enough to sweeten the pot. You can either add this information to your invitations, or simply post the contest to social media once you have your guest list. Focus on the contest as a fun challenge rather than just an alternative to traditional photography. It’ll also plant the idea in their head, so you’ll likely end up with a higher photo stock than if you simply added your hashtag to their seating cards. There are a ton of different photo-sharing apps available on the App/Play Store, including programs that are specifically for weddings. WedPics, Capsule, Wedding Party, and Guest Shots are all popular options that allow guests to easily and seamlessly upload their photos to a centralized location. This might be a more appealing option for guests who would rather not upload a ton of your wedding photos to their social media accounts, which would be required to use a wedding hashtag. You can also use the app as a way to contact your guests, set up group messages, and other features just like social media. 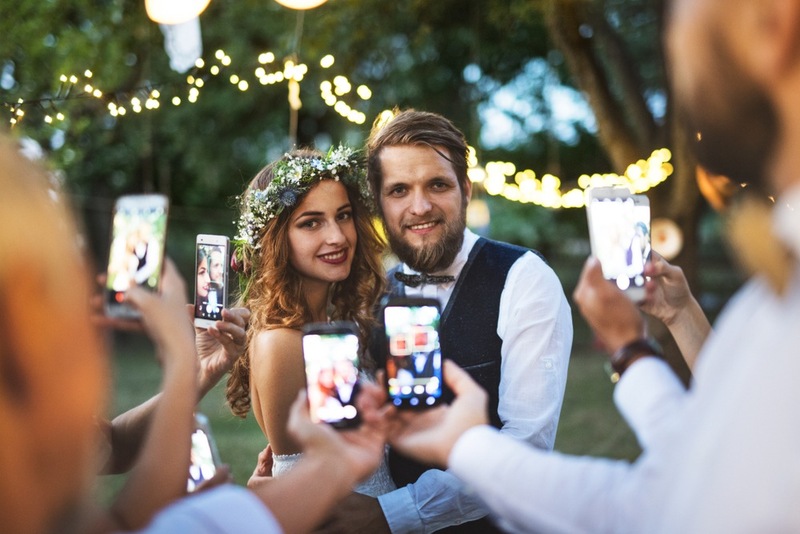 Whether you only want your wedding party to be in charge of photos or you’re opening up the opportunity to everyone, let your “potential photographers” know which app you plan to use so you’re all on the same page. Ideally, stick to free apps to maximize participation. You’ll certainly write a Facebook post about collecting guest photos, but also add a small blurb to your snail mail. Include a cute tagline or even a sentence or two with your hashtag or app of choice to the bottom of your physical Save the Date cards to inform your guests. This will make your crowdsourcing plans part of the event itself, almost like the theme or venue. The last thing you want to do is seem tacky or cheap. Instead, highlight the opportunity as a fun way for everyone to be involved in the memories of the happy couple. Also, this will give them even more notice and increase your chances that more guests will contribute. People are much more likely to send their photos during the event than after they leave, so set up the environment to make it easy for them. Make sure you can provide a high-speed connection, and consider setting up charging stations around the venue. Also, add small reminders to your cocktail or dinner tables. Tasteful stationary that matches the theme of your event is subtle, but useful. You don’t want to be too heavy handed since your guests are essentially doing you a favor. 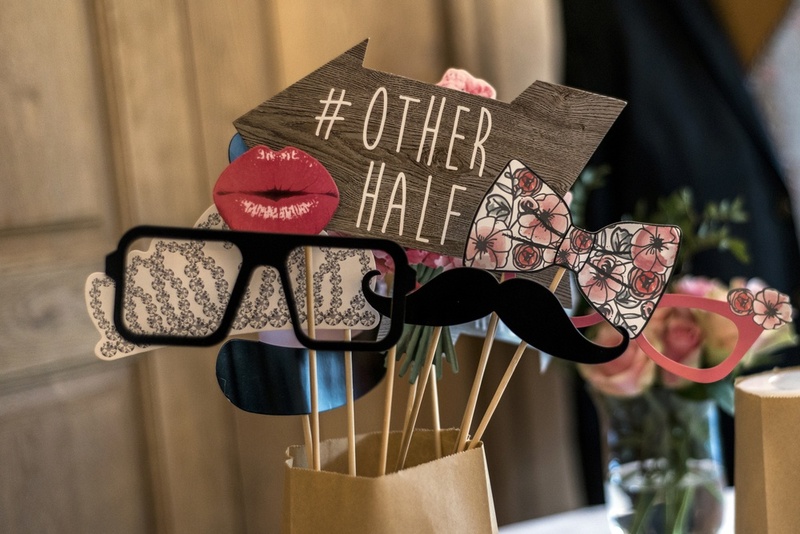 You can also create a photo booth for guests to use and take their own fun pictures. Include props and signs with your hashtag for increased exposure. How you position your guests could either create a variety of different angles or a sea of arms and phones down all of the aisles. When you’re arranging the furniture, keep in mind that people will have their phones and cameras out. You’ll want to prevent any arrangements that might block the view of other guests or, worse, ruin their photos with someone trying to take their own. Aligning the tables and chairs in a c-shape is one easy alternative to multiple straight rows or popcorn style. Visit the venue early in the process and really consider all of your options – and potential angles. During the event itself, everything from the wallpaper to the centerpieces will play a part in the composition of your photos. Keep that in mind when you’re choosing a theme and design, because you essentially want to create backdrops through every corner of the room. If you’re planning an outdoor wedding, consider the surrounding environment when choosing a motif. Otherwise, make sure all of your decorations, flowers, and even furniture is cohesive and consistent with the lighting and capacity of the venue. Minimalist designs that feature subdued accent colors or high-contrast hues photograph well, for example. Whereas busy and cluttered designs tend to dominate the frame. Your attendees could be the key to a collection of fun, emotional, and gorgeous photos from your special day. To make sure you’re filling your albums with the best options possible, consider these factors before deciding to crowdsource your photography. Saving money might be appealing enough, but you don’t want to risk missing out on capturing your best moments. With these tips, you can have the added benefit of your favorite photo being sentimentally snapped by your mother, nephew, or best friend.